Victoria Hall, Triq l-Oratorju, Naxxar - 1st turning on the right behind the Naxxar Parish Church. Antiques and Fine Art Fair. 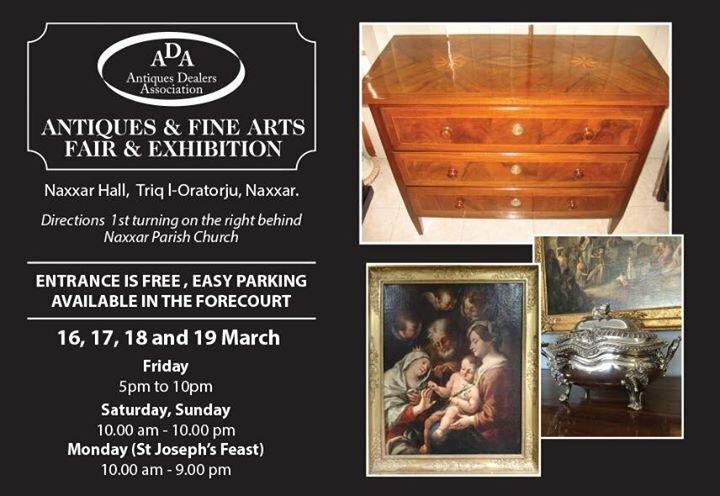 A relatively small number of dealers offering only the very best of antiques available on the Maltese market coming together to present a 'must visit' antiques event being held on the 16th/17th/18th/ and 19th March at the Victoria Hall, Triq l-Oratorju, Naxxar - 1st turning on the right behind the Naxxar Parish Church. Opening times are: Friday 16th March from 5.00 pm - 10.00 pm; Saturday 17th March from 10.00 am - 10.00 pm; Sunday 18th March from 10.00 am - 10.00 pm, and Monday 19th March (St Joseph’s Feast) from 10.00 am - 10.00 pm. We are child friendly and there is ample easy nearby parking. . Do please like this post, tag your friends and share this event please. ENTRANCE IS FREE OF CHARGE. EASY PARKING AVAILABLE IN THE VICTORIA HALL'S OWN FORECOURT.